The Dutch government has introduced the ‘Roadmap to wind energy at sea 2030’ (‘Routekaart windenergie op zee 2030’, source: Rijksoverheid.nl) which states where new offshore wind farms can be developed. New to be developed offshore wind farms that should generate 7.000 MW of electricity. However, is the emerging offshore wind industry ready for this major task? DOB-Academy has developed a unique training course in which all technical aspects, essential for the development of an offshore wind farm, are covered to prepare tender teams and all other involved parties for the challenges that lie ahead. The national energy transition to renewable energy will create a huge impulse on the job market for companies involved in renewable energy. It will lead to approximately 39.000 to 72.000 new full-time jobs in the entire renewable energy market (source: NOS, 18th March). Offshore wind is already an important source of renewable energy and it will become even greater over the years. Between the years 2024 and 2030 7.000 MW of offshore wind power needs to be installed. And in 2030 about 40% of all renewable energy should be generated by offshore wind farms. The Netherlands is not the only country that will invest in offshore wind the coming years. Apart from the thousands of new jobs, many other people will make the move within the offshore sector from oil and gas to wind energy. However, the offshore wind industry is significantly different from the offshore oil and gas industry. Offshore wind farm development projects have a new set of technical disciplines involved. These different skills are rarely readily available within a single company, let alone a single person. It is nevertheless the integration of these factors that is crucial in the optimisation of an offshore wind farm. Finding the right people with the right experience and knowledge may prove to be difficult in the current job market. Next to that, the design process starts during the tender phase of the offshore wind farm, thus these multi disciplines qualities are important from the very first start. And the tender phase starts years before the first construction/installation activities at sea. In order to be ready for the 7.000 MW offshore wind power that needs to be installed from 2024 on, the industry needs thousands of skilled people rather today than tomorrow. Therefore, the industry has to invest in training and education of their personnel. 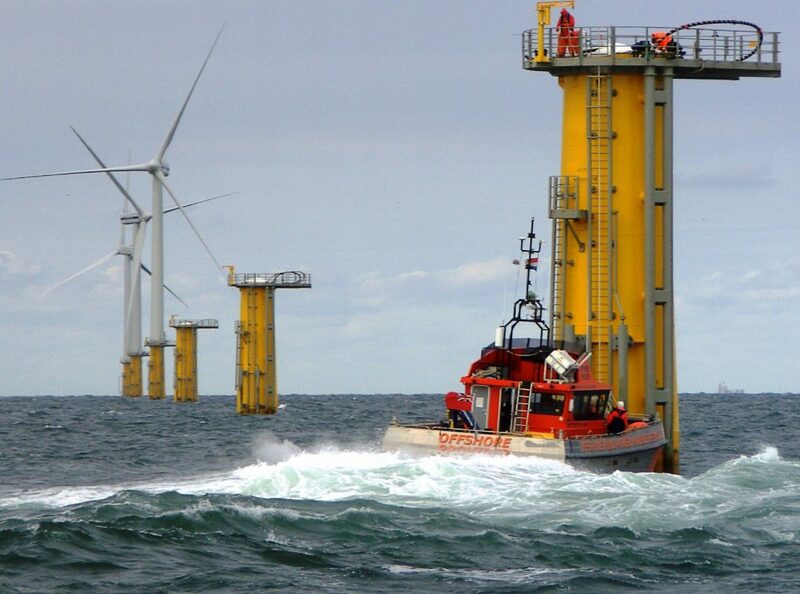 DOB-Academy is specialised in the training courses for the offshore wind industry. They have developed a unique concept in which lectures are supported by practical cases, developed and given in their own laboratory. They believe that simply presenting information in lectures is not enough, and that gaining hands-on experience is key in to truly training personnel. One famous case is the ‘installation miniature windfarm’ where teams compete against each other in installing miniature wind turbines in the water basin in the laboratory in Delft. The teams face real-life challenges, such as hidden boulders under the seabed, supply chain issues and rapidly changing weather conditions. Many other hands-on cases have been developed over the years at the academy, and not only in the laboratory. In-house tools and applications, based on software used in the industry, have been developed to simulate processes. The six-day training course ‘Offshore Wind Farm Design’ offers an multi discipline insight in all technical aspects of the design, installation and operation of an offshore wind farm. Participants are divided in teams and are faced with the challenge to development their offshore wind farm. Those in-house tools and applications are integrated in the project simulating the development processes. Lectures are alternated with hands-on cases and assignment using such tools. The programme of the training course is spread over three two-day sessions and follows the development of offshore wind farms. The first two days will be focused on site selection, data analysis and the (grid) layout of the wind farm. The third and fourth day will be mainly concerned with the wind turbine selection and support structure design. The final two days will delve into the installation and operations of the wind farm, as well as the completion of the preliminary design. The final project deliverable of the teams consists of a video of themselves explaining their design considerations and trade-offs for their design. Each two day session ends with each team presenting their intermediate design decisions in the DOB-studio in front of the green screen. Experts will guide the participants throughout these recording sessions. Afterwards animations will be added and their presentations are combined in one video per team, creating a unique final result for the teams to take back ‘home’. One of the qualities of the ‘Offshore Wind Farm Design’ training course is that it is suited for almost everybody working in the offshore wind industry who are involved in the tender phase. Thus companies such as developers, marine contractors, investors, insurance brokers, EPC(I) contractors, technical or service suppliers, turbine manufacturers, (semi-)government and other legislative bodies can use this training course to prepare their tender teams for the many future tenders to come. And even though many technical aspects are covered non-technical team members will gain useful knowledge for their day to day business. The future of renewable energy is huge and it will require many skilful new workers. Training these new workers is a challenge that DOB-Academy is ready for. The international training course ‘Offshore Wind Farm Design’ starts in May 2019.